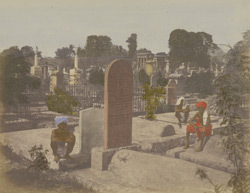 A Hand-coloured print of the Circular Road Cemetery, Calcutta, from the Fiebig Collection: Views of Calcutta and Surrounding Districts, taken by Frederick Fiebig in 1851. This is a general view in the Circular Road Cemetery, looking towards the MacNaghten mausoleum in the distance. Sir William Hay MacNaghten (1793-1841), was part of the Indian Civil Service, and was the British Envoy in Kabul during the First Afghan War (1839-1842). His mausoleum stands near the entrance to the Circular Road Cemetery which was opened in 1840.